Ask any road warrior for a list of essential gear aimed at maximising productivity while on the go, and a tablet Google Nexus 10 Review and Giveaway Google Nexus 10 Review and Giveaway Google has recently come out with a number of intriguing products, including the Nexus 4, Nexus 7, Nexus 10, and multiple different Chromebooks. I've recently reviewed a Samsung Chromebook, and Jackson has taken a look... Read More of some sort is bound to be on that list. Not everyone will agree though — some say that tablets are pretentious and you can’t really accomplish much with them anyway; those people prefer an Ultrabook Lenovo IdeaPad Yoga 13 Ultrabook Review & Giveaway Lenovo IdeaPad Yoga 13 Ultrabook Review & Giveaway The Lenovo IdeaPad Yoga is a laptop/tablet hybrid with a flexible screen which can be rotated 360 degrees, turning this seemingly regular-looking Ultrabook into a tablet. Don’t be confused by its appearance, though, this 13.3-inch... Read More in its place. Mainly, it’s the fact that tablets can’t do everything laptops are capable of — but you know what? That gap is closing in. However, I’m sure almost everyone will definitely agree that typing on a tablet’s on-screen keyboard is a huge pain. To remedy that, the market is currently flooded with various tablet keyboard cases. Some are quite innovative, others are meh. So how does the ClamCase Pro iPad Keyboard Case fair? We’ll first take you on a walkthrough of the ClamCase Pro; then, you guessed it, offer it up in a giveaway! The $169 ClamCase Pro is actually the company’s second attempt at an iPad keyboard case. The first version, known simply as the ClamCase didn’t fair well due to its cramped keyboard which was nearly impossible to type on. Despite that, it’s still available from the company’s website for $149. The ClamCase Pro addresses the whole typing issue; not only that, the keyboard section of the case is now enveloped in aluminium. At first glance, the case and iPad ensemble is slightly reminiscent of a MacBook Air. The keyboard connects to the iPad via Bluetooth, and is compatible with the iPad 2, 3 and 4. If you’re looking to spend less than $169 for an iPad keyboard case, and that’s completely acceptable, you might want to consider the Logitech Solar Keyboard Folio which is $40 less than the ClamCase Pro at $129. It features a full QWERTY keyboard and is solar-powered for perpetual preparedness. It’s also cleverly designed to adapt multiple positions for typing and media consumption. If that’s not up your alley, then you might be interested in Belkin’s upcoming Ultimate Keyboard Case — a thin and lightweight keyboard case which folds flat to allow you to hold the iPad like a tablet. In this arrangement, the keyboard actually faces the back of the iPad — a clever design that’s not only prettier, but also minimises accidental keystrokes. The Belkin Ultimate Keyboard Case will be available in May for $99. Granted, a keyboard case with over 60 buttons and an additional battery needed to power it will ultimately add bulk to the ensemble; and is therefore not for everyone, especially if you don’t intend to do much typing. Using the ClamCase Pro is invariably a trade-off between portability and typing speed. But if the iPad is your go-to device for work and play, then you’ll enjoy the ClamCase Pro. One particular group of people I can think of who will be able to appreciate the ClamCase Pro are students who prefer tablets over laptops. The ClamCase Pro will make note-taking in class much easier, and they’ll still get to play Angry Birds during breaks. The ClamCase Pro is essentially a two-piece case attached by a hinge in the middle. It’s basically made of plastic, but the keyboard is graced with an aluminium surface. At 680 grams, the case weighs quite a bit; and as you might have guessed, most of the weight is attributed to the keyboard. However, it also acts as a counterweight for the iPad so it doesn’t topple over. You’ll find the usual suspects on the iPad side of the case: camera, dock connector, and speaker cut-outs; volume rocker, the works. It’s also probably a good idea to mention that the ClamCase Pro supports the auto sleep/wake feature on the iPad, so shutting the case would automatically put the iPad to sleep. The case opens and close as a laptop would. There’s no fancy swirl or twist mechanisms here. It’s a simple hinge, and the case goes from fully shut to quarter-way open, which is ideal for typing; then swings back and acts as a stand for your iPad; and finally, all the way back so that the keyboard and the iPad are now back to back for tablet operation. When in tablet mode, however, the keyboard is completely exposed and must be disabled to prevent accidentally pressing on the keys. It’s also pretty uncomfortable, not to mention tiring, to hold single-handedly since it’s both heavier and thicker with the case on. And if I’m honest, I don’t enjoy holding it with the keyboard against my fingers — it’s just uncomfortable. Things start to look better in typing mode. It seems as though it’s calling out for some work to be done. The case features a full QWERTY keyboard with several dedicated keys which perform specific functions i.e. check battery level on the ClamCase Pro, simulate the iPad’s Home button, invoke Spotlight, increase/decrease volume, start a photo slideshow, play/pause, etc. There are even buttons to help make Cut, Copy and Paste operations a one-touch affair. I can also appreciate the weight distribution better with the iPad in the case. There’s no doubt about it, it’s heavy; but the whole ensemble feels very stable in the typing position. However, the hinge is slightly too “sticky” for my liking, in the sense that it requires quite a bit of force to get it moving. But I guess it plays a role in helping the iPad stay in a particular position. The keyboard connects to the iPad via Bluetooth. In fact, if you didn’t already know, that’s the only Bluetooth function that the iPad can perform. Anyways, setting up is rather easy: turn the keyboard on and switch it into Discovery mode. Enable Bluetooth on the iPad and pair the devices together. Bingo bango. Now, let’s take a look at the core function of the ClamCase Pro — typing. As soon as my fingers hit the keyboard, I’m stricken by the familiar feeling of physical keys, which is kind of satisfying. Then, I start to realise how small the keys are. They measure (w) 13 x (h) 14 mm whilst the keys on an Apple keyboard are 15 x 15 mm. If my calculations are correct, the keys on the ClamCase Pro are 20% smaller. Nevertheless, it’s still very usable albeit a little cramped. I can’t imagine how the first rendition was like to use. Naturally, typing speed improved while using the ClamCase Pro. More importantly, punctuation keys are more easily accessible, because they’re where you’d expect to find them on a regular keyboard. In fact, the ClamCase Pro keyboard also includes Control, Option and Command buttons — and they too, perform exactly as you’d expect they would on a desktop. They keys are a little springy and much narrower than I’m used to but overall, it’s a major improvement compared to typing on the screen. And before you ask, no they’re not backlit. There is however, one problem with using the ClamCase Pro — my finger keeps reaching for the trackpad except, there isn’t one! I have to persistently remind myself that I’m typing on my iPad and I need to reach for the screen instead. The ClamCase Pro boasts a respectable 100 hours of uninterrupted use before requiring a recharge. A full recharge would take merely 120 minutes and the device is able to hold that charge for 6 months. Unfortunately, I wasn’t able to personally put these claims to the test but during the entire period I was reviewing the ClamCase Pro, I never had to recharge the keyboard case once. The case can be recharged using the supplied micro USB cable. For the road warrior, this may mean an additional cable to bring along but the battery in the ClamCase Pro is so efficient that charging it just before a trip should suffice. Well technically, it should survive a 10-day trip quite easily even if you’re chugging away at the keyboard 8 hours a day. Should you buy the ClamCase Pro iPad Keyboard Case? Personally, I don’t do much typing on my iPad but I do see the value of a keyboard case. Typing on physical keys is less awkward and generally more efficient time-wise. But the question here is, should you buy the ClamCase Pro? My main concern is the steep $169 price tag, and I can’t be certain that paying that amount of money is justifiable. For me, a better choice would be the Logitech Solar Keyboard Folio, save myself $40, and never bother with charging it. But it could just be that I’m a nut for anything solar Eton Mobius Solar Panel iPhone 4 Case Review and Giveaway Eton Mobius Solar Panel iPhone 4 Case Review and Giveaway When I stumbled upon the Eton Mobius Solar Panel and Battery Case for the iPhone 4, three words crossed my mind: perpetual renewable energy. Wow, never having to charge my iPhone by plugging it in... Read More . The ClamCase Pro is a good idea, but the overall added chunk puts me off. The keyboard position in tablet mode isn’t ideal. I’d wait to see how the Belkin Ultimate Keyboard Case turns out. MakeUseOf recommends: Probably not a good idea. 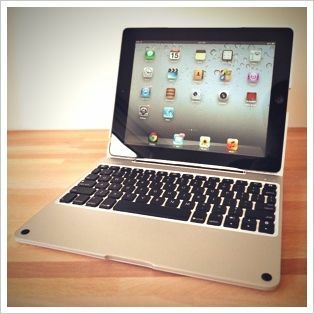 How do I win the ClamCase Pro iPad Keyboard Case? The giveaway is over. Congratulations, Alan Hewson! You would have received an email from jackson@makeuseof.com. Please respond before May 5 to claim your prize. Enquires beyond this date will not be entertained. This giveaway begins now and ends Friday, May 3rd. The winner will be selected at random and informed via email. Explore more about: iPad Case, Keyboard, MakeUseOf Giveaway. I like the idea of this clam shell case. I could see myself purchasing one if I used my iPad more than I do. Problem is that the Adobe apps that I used don't really work very well for what I do with them on my iPad. My Dad would love this case. He can't stand typing on the screen and I have recommended this to him. Hopefully can win this time. Looks good, I'll be waiting for mine. This looks really nice & yes a iPad would be really cool! Jackson, this would be ideal for my granddaughter (she is 12 and bought her own iPad with her own hard work). Typing slows her down on the iPad and besides that, it is a cool gadget. My son would like it too - major gadget junkie! Thanks for the thorough review. I don't have a tablet only an iPhone which is all I want for now! That's great of her! Yeah, I'm sure she'll love it. The drawing is random though but I guess there's no harm cheering for her. I have tested and tried several iPad keyboards and none have come close to my satisfaction. I am hope that this new model (ClamCase Pro) does the job right! I don't own an ipad, so I am going to skip this offer ! Regards and good luck to the others who enter into this contest ! ... in orange, if possible! With the ipad.. I'm going to share it to everyone i know. This is damn cool! How I wish I could this giveaway. I would love one ? I've tried a few keyboards, and always have some issues. I am hoping this one will be different. I know better, as I use my iPad with one keyboard or another all the time. It's not for everyone, but if you do a lot of writing a good keyboard is a great accessory for the iPad. The ClamCase Pro is a special keyboard and case for all iPads released after the first generation. It functions as a stand for the iPad in a form that turns the tablet into a laptop. The case is light for such a protective case with an integrated keyboard. When closed, the unit (with iPad) is smaller than a MacBook Air and only slightly thicker. The weight of the ClamCase Pro with iPad onboard is just under three pounds. I disagree. It isn't light. But it's nice to type on, I'll give it that. If it were me, I'd rather a MacBook Air, to be honest. Dang it looks nice and sleek but I already got a New Trent keyboard and it was only $20. I can't see myself overspending that much for a bluetooth keyboard made specifically for an iPad. Also I'm a sucker for solar keyboards as well. Logitech's solar keyboard case looks really tempting! We might review one. What do you think about that? Sorry, forgot to mention that the iPad is sold separately. I still thinking I could win this before mine gets shipped. I think reviewers got all of them from the first run. Look for a rather long wait time for your case. I've read anywhere from a small 2 weeks to month plus. The case has been released, I'm just not sure what the hold up is... Amazon had them for a short time but the 20.00 off coupon was only good on the devs site. I'm considering canceling at the end of the week and saving some cash and getting the Ultimate Keyboard Case for iPad from Belkin... What's another month of waiting, right. I think that'd be a good idea. At the moment i am using a logitech keyboard. But not one of those flat ones. It looks more like an apple keyboard, but it comes with a case that i can use to prop my ipad on. It works great. But i guess this one is nicer for typing on your lap. Yeah, it's not bad. The weight helps to keep it down.